Stocks in London are set to open higher today lifted by an upbeat tone from the Federal Reserve chair on his testimony yesterday. The focus now is on UK inflation data due later in the day. The UK CPI for June is seen accelerating to 2.6% from last month's reading of 2.4% on an annual basis, though slowing to 0.2% growth month-on-month from 0.4% in May. Moreover, UK corporations such as EasyJet, GVC Holdings and Smiths Group, are expected to deliver good earnings performance and this might give yet another boost to the FTSE100 during the next few days. 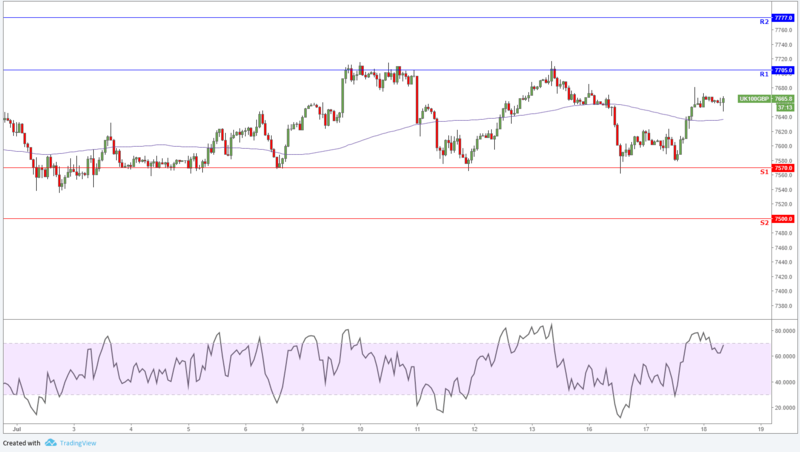 From a technical perspective, the FTSE100 did not breach the 7570 support level yesterday, instead a bullish momentum caused by positive comments from Fed Chairman Powell helped push the index back above the 100MA. Look for a test of the 7705 resistance zone today.